Donkeys are vital to the farms on which they work; they provide horsepower and transportation. If a donkey cannot walk due to hoof fungus or disease, the farm as a whole suffers. The hoof of the donkey is more U-shaped than that of the horse, and sports reinforced heels that aid in climbing and trekking upon hard ground. Your donkey's hooves are also more pliable than horses' hooves and can deform easily, especially when exposed to fungal diseases. The most common sign of a fungal infection, such as thrush or white line disease, is the smell that comes from the hoof when picking out debris. The fungal infection affects both the frog and the heel bulbs of the hoof, and black, foul-smelling material can be seen inside the hoof itself. If left untreated, the fungal infection can penetrate the deeper, more sensitive layers of your donkey's foot, causing your donkey to become lame. 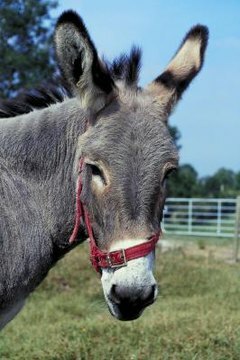 Donkeys left for long periods of time standing in unsanitary conditions or resting in uncleaned bedding can quickly develop thrush or white line disease. If your donkey rarely sees a farrier, or if the hoof is not kept clean, fungal infections can occur. In some cases, however, fungal infection originates through poor hoof conformation or feet that are too soft, allowing infection to take root. In the latter cases, a change in diet and exercise is as important as traditional fungal treatment methods. The first step in treating your donkey's fungal infection is a twice-daily picking and cleaning of the hoof. Clear out the black fungal matter and flush the entire hoof in disinfectant. Once the hoof is completely cleaned out, apply a topical application for fungal infections, or pack iodine-soaked cotton balls into the hoof. Remove the old cotton balls and replace with new ones during each cleaning. In some cases, the frog of the donkey's hoof will need to be pared by a farrier to eliminate damaged or infected tissue. Awareness is the No. 1 step in preventing hoof fungus from affecting your donkey. During dry seasons a weekly check-up of your donkey's hooves should be sufficient -- unless they are limping or expressing discomfort. In wet seasons you should check your donkey's hooves frequently, and keep them clean of mud, gravel and wet organic matter, such as grass or hay. Keep your donkey's bedding clean and dry, and exercise him in a well-drained area. It can take up to a year for your donkey's frog to regrow after a bad fungal infection; cleanliness and attention are your best tools for preventing a second attack. Can You Hurt a Horse's Hoof While Cleaning It? How Does Foot Rot Happen?